Actual size is approx 3/4 inch square. View photo of this and other lapel pins. 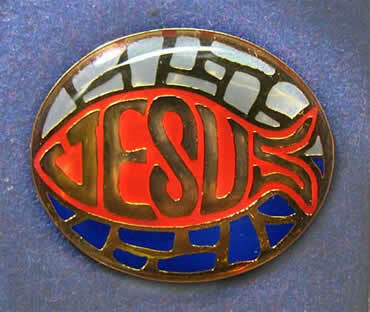 The ICHTHUS or fish is an early Christian symbol created by using the Greek letters which spell out "Jesus CHrist God's Son Savior." The ichthus symbol is on a globe of heaven and earth, sea and sky. Jesus is Life and spiritual food for all who would receive Him.